Second (or Third) Time’s the Charm? In recent radio interviews I’ve done, a number of callers have mentioned how their second weddings were far better than their first. They felt more ownership over the celebrations and found them to be more meaningful. This, I suppose, could be a result of the advanced age of the celebrants the second time around, or it could be that second-timers have learned from their mistakes. Or, ideally, it could be a result of marrying a more suitable partner. In any case, the world of second (or more) weddings is a topic that keeps coming up. I thought this summer might be the long-awaited Brangelina wedding, or that Jen Aniston and Justin Theroux might tie the knot (it would be the first marriage only for Theroux). But those couples seem to be hedging their bets – and keeping quiet on when the celebrations might take place. 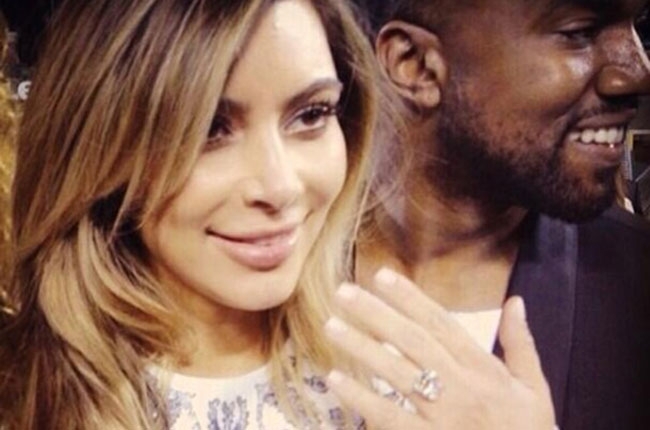 Kim Kardashian and Kanye West, very recently engaged, may beat them all to the altar. I’m thrilled with their engagement for the wedding talk it undoubtedly will generate – and very curious to see how they proceed. On the one hand, there’s a suggestion that the two are moving toward a modicum of privacy in their private lives as they’ve done well to limit baby North’s public exposure. But then, there’s Kim’s postpartum selfie. And a stadium proposal. So the possibility exists that we could have another Kardashian wedding extravaganza on our hands. My sense is that in the past, a second wedding, particularly one conducted after a divorce, necessitated an almost subdued celebration style. But I think the sentiment that suggests a couple go low key if one or the other has already been married is increasingly becoming something of a relic. Similarly, whereas when a bride was of an advanced age, say over 35 (advanced, obviously, only in the scare-women-into-marriage-as-quickly-as-possible wedding world of mid-century [when, really, 25 was considered “advanced]), the expectation was that she forgo the pomp and circumstance, trading in childish bridal dreams for a sensible suit and simple ceremony. That notion has gone the way of the dinosaur. Expectations of wedding celebrations, like American culture as a whole, have changed. Whereas public sentiment about what a person should do once held much greater sway, the private desires of what a person wants to do now reign supreme. In any case, I think the public is inclined to give second-timers a pass, particularly when they move toward simpler, more heartfelt celebrations. There is likely to be less judgment of a couple when the second shot at love seems authentic. I wonder what that will mean for Kimye. Kanye generally leans toward theatrical while Kim’s wedding to Kris Humphries (her second marriage) was nothing less than a spectacle, with its corporate sponsorship, subsequent E! broadcasts, and multi-paged coverage in national print media. I doubt that either will push for a quiet celebration of closest family and friends, off the beaten path, outside the public eye. But if their natures and their trades lead them toward spectacle, is their union any less legitimate than those who scale back on the second take? Is it fair to doubt the authenticity of their romance? And if the second (or third) time is the charm, and the love feels truer and more real, what should stop a couple from celebrating in a style of their choosing? I realize Kim is the woman who cried love once already – and very publicly (and after a first failed marriage) – so those who have their doubts about the depth of the reality star’s affections have their reasons. But I’m curious to see which will prevail: amendments to wedding culture that allow for some flexibility and forgiveness or the tendency toward an increasingly mean-spirited overarching critique of American weddings and their celebrants (unnecessary, excessive spending, privileging the wedding over the marriage, etc., etc., etc. ).